The working of Zojirushi NHS-10 is quite simple. 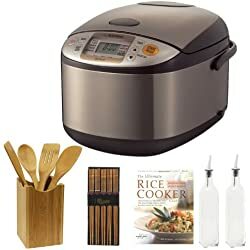 However, there are sensors and other mechanisms to make it better and more reliable than conventional fuzzy logic rice cookers. It operates at regular 120V and an optimum power level of 500 Watts. This round rice cooker contains two parts, the external part with the heating element and the inner non-stick cooking pan or bowl. The detachable inner cooking pan makes it quite easy to clean and maintain. The power cord supplies electricity to the external vessel which produces heat via the heating elements. The inner cooking vessel fits inside this part touching the heating plate at the bottom. There is an electronic heat sensor which regulates the temperature of the plate. Once the rice is cooked, it even cuts off the power. The feature which sets the Zojirushi NHS-10 apart from its competitors is its capability to automatically turn on the stay warm function. After the cooking process is completed, the machine automatically goes into stay warm mode which keeps the cooked item hot and fresh for another 2-3 hours before serving. There are three models in the NHS family. The NHS- 06, 10 & 18 for 3 cups, 6 cups and 10 cups cooking capacity respectively. A measuring cup comes as an accessory with all the models. One cup is approximately equal to 6 oz. of uncooked rice. The model is built to Japanese standards and all the markings are etched accordingly. However, unlike us Americans, the Japanese use short grain rice. Therefore, while cooking long grain rice or brown rice, use at least 25% more water as specified in the manual. The NHS-10 is best suited for a normal sized family. But if you are a regular host, go for the NHS-18. It can cook up to 10 cups of uncooked rice at a time and also has a bigger steaming tray. The prize difference between these two models is almost negligible as compared to the difference in their capacities. The NHS-10 also comes with a steaming tray which can easily hold vegetables, fish, etc. for a normal sized family. 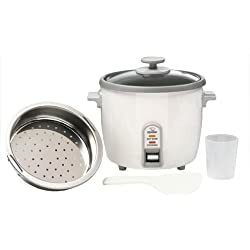 The ergonomic design of the Zojirushi NHS-10 6-Cup (Uncooked) Rice Cooker/Steamer & Warmer, Whiteis what made it the most popular automatic rice cooker among customers. This shining white colored lightweight rice cooker only weighs about 4.7 pounds. The outer color coating is stain free. That means if anything ever spills; just wipe it off with a damp cloth. For easy maintenance and operating conditions, the inner vessel is non-stick coated and the model comes with strong stay cool attachments like handles and knobs. Multipurpose Cook, steam, and keep food warm. Special stay cool handles and knobs for easy handling. LCD display and automatic sensors and timers for easy hassle free cooking. Short, detachable, optimum length power cord no tangling, no tripping. 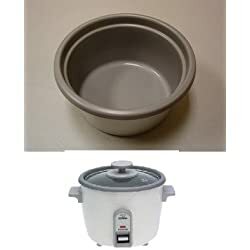 Detachable and non-stick coated inner vessel for easy cleaning. See through glass lid for easy monitoring. Automatic switch to stay warm mode. The Zojirushi NHS-10 is a durable, long lasting and high performance appliance. The majority of the customer reviews on the internet are in favor of NHS-10. The appliance has been made to Japanese requirements where rice is cooked more than three times a day. At its full capacity, i.e. 6 cups, the appliance takes about 40 minutes to cook the rice. Steaming time differs according to the vegetables and quantity of fish. However, after cooking, it is highly recommended to keep the food inside for about another 10 minutes before serving. For cooking, first thoroughly clean and then place the rice or other food in the inner vessel along with water. DO NOT USE THE INNER VESSEL FOR CLEANING. Fit the inner vessel inside the external part properly. Set timer and relax. For steaming, put some water in the inner vessel and set it for 10 minutes. Wash the items to be steamed and put it on the steaming tray. Once the timer buzzes, open the lid and place the steaming tray inside. Close the lid and set the timer for another 15-30 minutes as required. Place the food in the inner vessel and switch to keep warm mode. When using this function with brown rice preparation, use another cup of water after the rice has been cooked to prevent the rice from becoming dry. Sometimes, the power cord may seem too short. Some manipulations are required when cooking long grain rice. If you are a regular sized family, I would definitely recommend you the Zojirushi NHS-10. Its tough, durable and makes your life so much easy. Except for a few minor glitches, I am unable to think of any other shortcomings. However, if you need some help with cooking instructions, I had say you follow some blogs rather that the poorly written company product manual.